Just a simple masala to catch up with ur food. A matching combo of brinji n drumstick usually adds a little kick to ur daily meal and this masala will definitely make an entry in ur thali when u go for lunch outside in Chennai.. I've added some tamarind pulp and coconut powder to this which in turn makes this masala sweeter as well as lil bit tangy , i mean ,just a hint to add that kick.. So here goes.. Tomatoes -- chopped -- 1 no. Take a wide kadai and pour the oil. Add the seasoning ingredients one by one and fry them. After that add the onions and scald well in the hot oil for a minute. Then followed by chopped tomatoes and cook until it turns mushy. Now it's time to put the drumstick and cook well in the masala for 5 minutes by adding a cup of water as the drumstick takes a bit long time to cook.Add salt also..(or otherwise u may cook the drumstick seperatley and add this to the masala) .Later add the brinjals as well and scald well. Now add the redc hilli powder,turmeric powder,coriander powder and coat with the veggie's.Dump in the tamarind pulp and combine well . 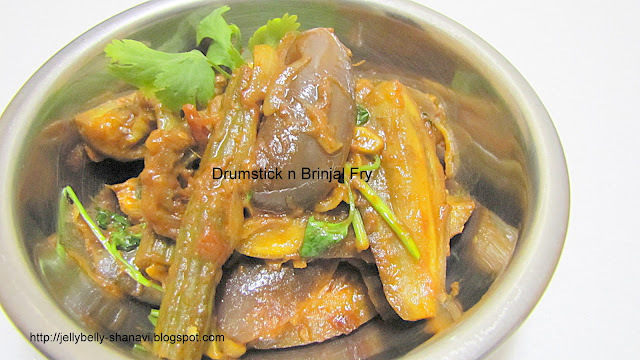 Turn the heat to medium low and cook the brinjals and the drumstick in the masala until they are cooked. Finally add the coconut powder and scald well in the masala. Mix for a minute and then switch off the flame.. Njoy..
My fav combo, just love with rasam or with curd rice..
hot rasam and this fry ...Mmmmm just divine...love your version Shanavi..tempting click..
lovely combo--will go perfectly well with piping hot rasam sadam ! nice combo and nice click..loved it..yummy yumm! !